I was going to make our standard quiche for brunch when I thought, “Why not try something new?” I did, and it turned out pretty good. This recipe came from Oprah Magazine, and it piqued my interest enough however many years back, to tear it out and throw it in the “I will try this someday” recipe abyss. 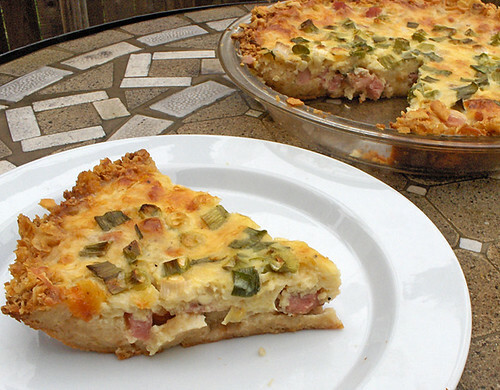 This was an interesting quiche, and while JP preferred the use of sharp cheddar as opposed to our usual Swiss in this recipe, Mom and I thought that while this was a good quiche, the original is better. I would like to try it with the perfect crust, as opposed to this cracker-crumb crust, but this was decent, if a bit salty. I liked that the consistency of the batter was thickened by the cottage cheese. There wasn’t a single drop on the floor of the stove, and the crust held up much better than I thought it would. Ritz crackers, saltines or chip crumbs all work beautifully to make a buttery crust. 1. Preheat oven to 350. In a medium bowl, mix together crumbs and butter. Press mixture into a standard 9″ pie pan to form the crust’s bottom and sides; bake 10 minutes. 2. In a large bowl, whisk together milk, cottage cheese, mustard, salt, pepper, and eggs. 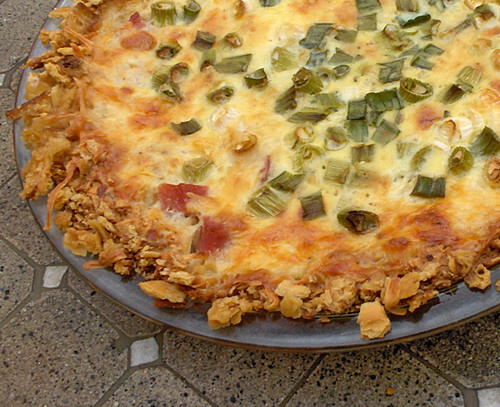 Scatter 1/2 cup cheese over bottom of crust, then pour in egg mixture. Toss remaining 1/2 cup cheese with ham and scallions, then scatter over eggs, pressing down gently. Place a tray on the bottom rack of the oven to catch drips, then bake quiche on middle rack until eggs are set and top is golden, about 50 minutes.